Why do we lose our teeth? Multiple factors could cause tooth loss, such as severe injury to the smile, untreated infection, or in most cases, periodontitis. The advanced stage of gum disease, periodontitis is the single largest cause of tooth loss in adults. No matter what the cause, the result is an unsightly gap in your smile, one that could increase the risk of misalignment, TMJ disorder, and bruxism (teeth grinding). Instead of letting your oral health and quality of life suffer, why not talk to your Richfield dentist about a possible solution? How Do You Create A Bridge? 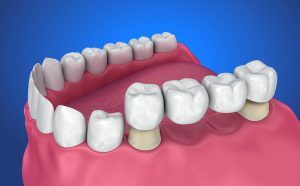 We begin the process by preparing the teeth sitting on each side of the gap in your smile. We will need to remove a small amount of tooth structure from each one. Next, we take detailed impressions of your smile. We send these materials to a dental lab, which will create your new teeth. In the meantime, we may provide a temporary prosthetic. At a dental lab, the impression will be used to design and create the bridge using lifelike materials. When you return to our office, we will check the fit, make any necessary adjustments, and place your new teeth. The crown attached to each end of your prosthetic will be placed onto the prepared teeth in your smile. The crowns then anchor your pontics, or new teeth, in place. With this lifelike prosthetic, our team can replace between one and three lost teeth in a row. With proper care and attention, your new prosthetic could potentially last between 10 and 15 years! You need to brush your teeth, bridge included, twice a day for about two minutes each session. Be sure you use a toothpaste that contains fluoride! Flossing nightly is also critical for ensuring the health of your smile. You will need to clean the space between the top of the gums and the bottom of your prosthetic as well, as food could become trapped there. If you have any questions about our lifelike dental bridges, then please contact our team today. Don’t just live with your tooth loss, talk to us about possible solutions. 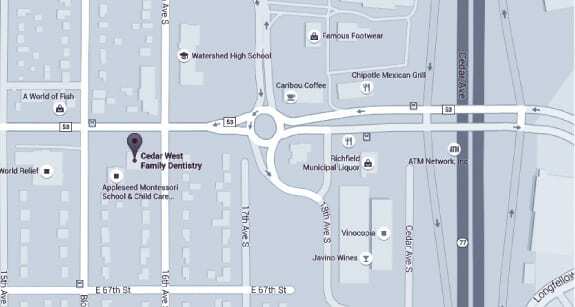 To learn more about tooth loss solutions, schedule a consultation with Dr. Keller by calling Cedar West Family Dentistry in Richfield, MN, today at (612) 861-7188.